The CBKZ-FS5RIF upgrade licence allows the PXW-FS5 camcorder to output 4K (4096x2160) RAW at 23.98p, 25p, 29.97p, 50p and 59.94p, recording to the AXS-R5 external recorder attached with the HXR-IFR5 interface unit (sold separately). 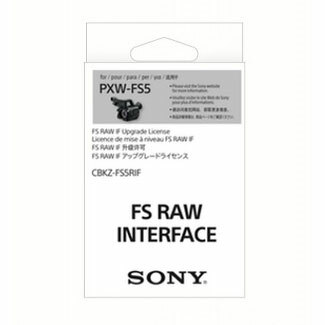 PXW-FS5 requires Version 2.0 firmware or above. Simultaneous XAVC HD internal recording. While outputting 4K/2K RAW to the AXS-R5, it is possible to simultaneously record XAVC HD on SD memory cards in the camcorder’s internal dual media slots. One application of this could be that the RAW recording is used for production and XAVC HD for on-set review. 4K cached RAW output. Approximately 4 seconds of cached 4K RAW can be output at 100 or 120 fps as 23.98p, 25p, 29.97p or 59.94p. Continuous high speed 2K RAW output. You can output continuous 2K RAW at 100, 120, 200 or 240 fps as 23.98p, 25p, 29.97p or 59.94p. A: Sony USA does not permit us to export Sony products to Australia.